Imagine being only eight inches tall and trying to cross a river or even a large field of crops. What a huge impossible task! Even though these tiny monkeys are extremely quick and agile, they haven’t become dispersed over a great area. Brazil is the only country known to host the Golden Lion Tamarin. Only three areas within Brazil’s borders offer habitation for the beautiful primates. Research shows that a mere 500 of these animals are in existence today. Great concern and much thought have invested in finding ways to raise the number Golden Lion Tamarins. The Golden Lion Tamarin is one of the smallest members of the primates, but one of the largest members of the tamarin family. This tiny creature weighs less than two pounds. Its long silky, golden fur frames its face in a mane-like fashion giving it its name. This wee monkey has sharp claws that help it grip the tree branches it hangs out in during the day. Insects, fruits, flowers, spiders, snakes and lizards comprise the diet of the omnivorous Golden Lion Tamarin. The male Golden Lion Tamarin takes his role of fatherhood quite seriously. Not only does he assist in raising his young, he assumes the role of midwife and aids with his newborns birth. It’s not unusually to see him carrying his youngsters around in a piggyback style similar to the way many human fathers carry their children. The female most often gives birth to twin baby tamarins. The small number of these cute primates has inspired zoos around the world to begin breeding them. As many as fifty new Golden Lion Tamarin babies are born each year. A reintroduction program has been initiated that allows the monkeys to be released into the rainforest of Brazil. Up to seventy percent of those released die because of their inability to adjust to the new surrounding of the wild. Halfway houses are being created in attempt to lower the mortality rate. These are large caged areas of the forest where the Golden Lion Tamarins can learn to adjust to the wild. Researches hope that the babies of monkeys reintroduced to the wilds will be better able to exist on their own. 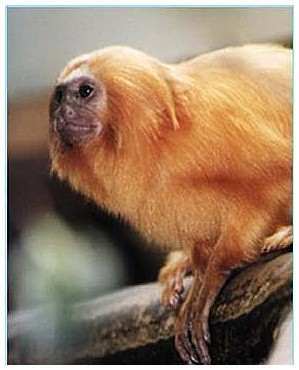 E-mail to add your Golden Lion Tamarin related website.